Young Ricky Toledo fell in love with the wrong person. She fell in love with a killer. After killing someone close to her, she develops complicated feelings within her head. A mixture of lust and anger, she can’t help how she feels. She isn’t sure what to feel, but she does know one thing, she must catch up to him before it’s too late. 18-year-old is a noir and a twisted love story combined into one. Ricky is a young 18 year old woman who is trying to figure out her life. Like most people her age, sometimes the feelings come from all sides, and confusion sets in. She doesn’t seem to know much about what she is doing really, but she knows she has to do it, and it gets her into trouble along the way. 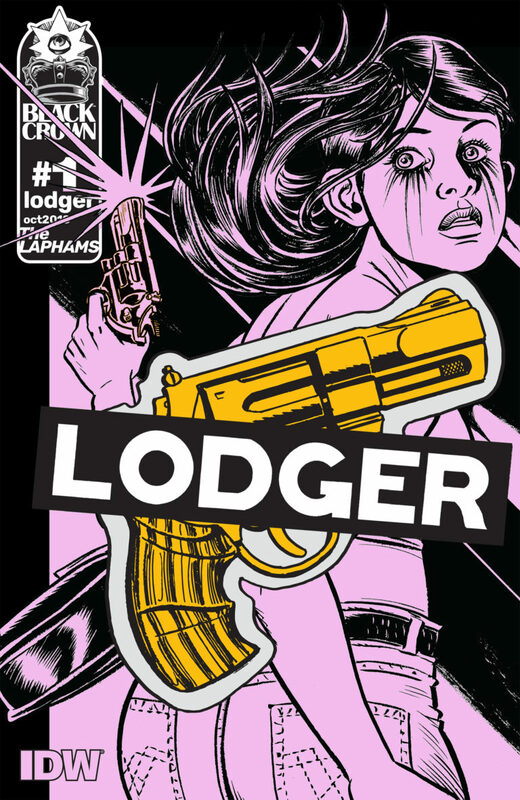 “Lodger” is the beginning of a new series by married couple David and Maria Lapham, otherwise known as The Laphams. From the very first panel, this feels like a classic crime noir story. Everything from the first person perspective of the story to the artwork feels right. The black and white art style might be off-putting for some, but it works well with the story. The story is slow building, but by the end of the first issue, you have a good grasp at what is going on. This book certainly appeals to readers of the genre. It is precisely what you think it is. It isn’t pretending to be something it’s not. “Lodger” is the real thing. Check it out if you get a chance.